It’s finally finished. Done. Complete. Shoveled, tamped, screed (I learned new words even during manual labor), placed, jointed, treated and sealed. Our backyard oasis is online after a month of hauling material back and forth from the local home improvement stores and assuring my bank that no, my credit card had not been stolen by Bob Villa on a coke binge. It’s ready for me to kick back, relax and enjoy the coming Texas fall (way too freaking hot in the summer.) Of course, it’s raining right now. 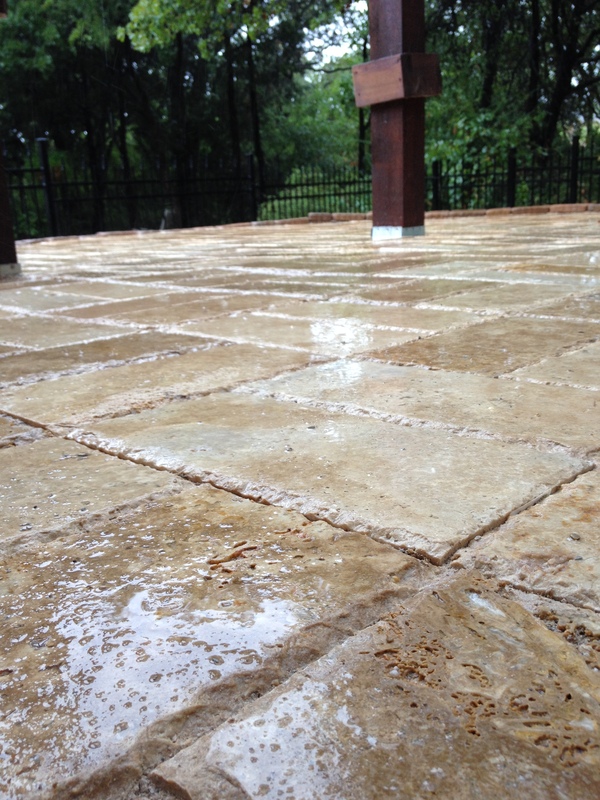 Hasn’t rained in months, unless you count the gallons of sweat I added to the paver base under the triple digit sun. Aside from sweat, there are approximately 4000 pounds of sand, a few thousand pounds of gravel, 1500 pounds of Travertine and several gallons of sealant now resting where my rather boring patio used to be. It was a welcome break after my novel binge but I’m so ready to be back at my keyboard. How do I know this? The other day, I was trimming the hedges and had a strange sensation. It was a mental twitch of sorts. I stopped mid-clip and tried to pin it down but it squirmed away. It was as if something rattled in a cage deep inside my brain. Instantly, I knew it was a story idea. Or premise for a novel. Not sure. Sound odd? It really kind of was. I have no clue what prompted it and can’t even say what the damn thing wanted. Annoyingly, I’m pretty sure it wasn’t the novel I’m working on at the moment. But for several minutes I had this feeling, completely disassociated from any sort of tangible details, simply a thought that I was on the verge of discovery. And that was it. After that, I ran across a tweet that almost described the feeling and re-tweeted it. The sense that there’s a boiling point to the cauldron of literature we steep ourselves in. Presumably, I’d hit mine. Or that writer inside had hit it. Shook the chains. Rattled it’s tin cup along the bars. I’ve been reading a few books lately as I worked on my DIY project, but not so much writing. It was a break I meant to take after I finished my novel, but never really did. I kept trying to work on stories, pushing forward with my idea for a self-published anthology. Eventually though, I settled into a routine that didn’t include much in the way of writing. In the past I was writing five days a week working on both Collateral Damage and short stories. Now I found myself spending most of my days outside, coming in exhausted, drenched and out of synch with my writing brain. I think it was trying to escape. That was what that feeling was. Well, here’s to seeing what happens when I stop staring t this key and unlock the cage door. I’m curious. A bit frightened. Hope you guys continue to tune in to find out what comes of it. I agree that most writers need a break between works. it renews the enthusiasm. Sort of like a sip of something between courses at dinner. Ya! The palate cleanser that is patio installation 🙂 Great to hear from you, Regina!